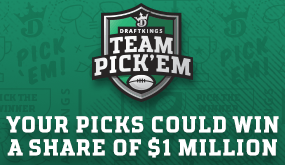 DraftKings announced a cool new free weekly contest for the NFL season! 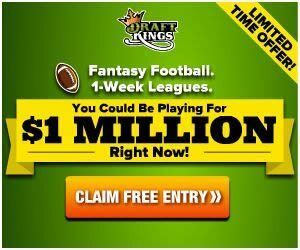 Play Free to Win your share of $1 Million NFL Week 1! Simply pick the winning team of each NFL game for the week. If you get over half of these picks right, you win cash prizes! The more correct picks you make, the more you win! For the week 1 contest, the prize pool is a whopping $1 Million! Week 1 games for this contest begin on Sunday, Sept. 9, 2018. Fantasy footballers, don’t miss out on your Free chance for your share of this guaranteed $1 Million prize pool to kick off the season!